My first finish of 2018 was this eye spy in red. 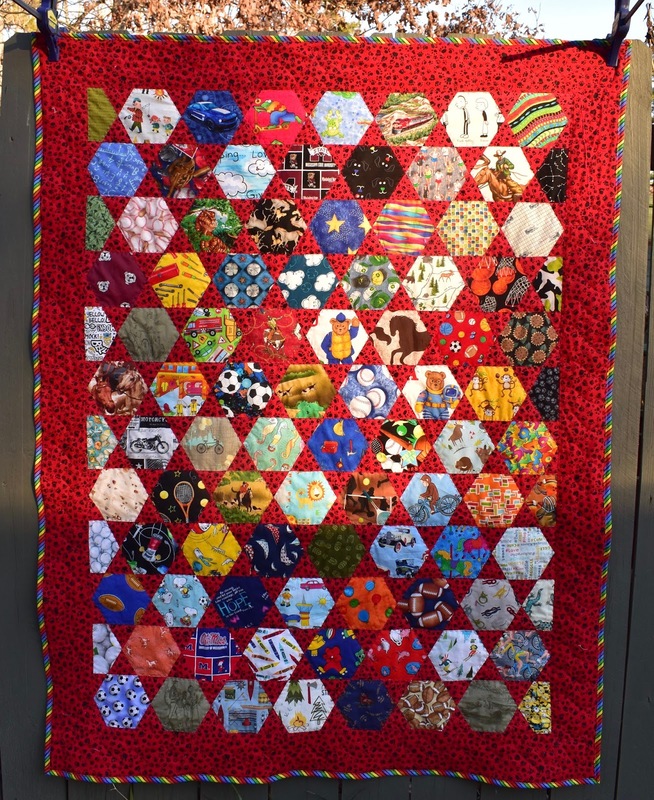 I use Pat Yamin's Come Quilt with me Templates for her larger eye spy blocks. Here is a link to her page. I made it for my neighbor John Henry who walks with me. I had hoped to finish it by Christmas, but with working so close to Christmas Day I couldn't get it done. So once I had finished it, I took it over to their house and the kiddos were not home! They were off to the movies with their grandmother. So I left the two quilts with the parents. When they got home they came over to thank me. They were so appreciative and sweet. John Henry was so pleased, he had already picked his favorite blocks. It was touching to watch how he folded it ever so carefully. 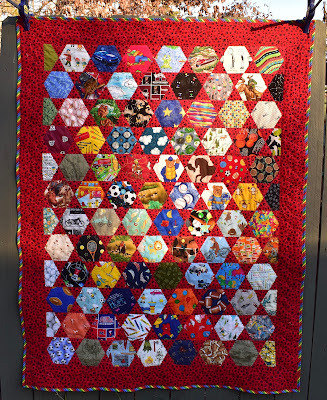 This quilt came out to be 61 x 47 so a nice sized throw for a little boy and he can use it for a throw for quite some time before he out grows it. I mostly chose camping, sports and animal prints for John Henry. I forgot to photograph the back, but it is a navy blue fabric. On to the next UFO!! Sew long, it is back to work tomorrow if the weather doesn't keep us out of school.